A myelogram, also known as myelography, is a diagnostic imaging procedure performed by a radiologist. It combines the use of a contrast substance with X-rays or computed tomography (CT) to evaluate abnormalities of the spinal canal, including the spinal cord, nerve roots, and other tissues. The contrast “dye” is injected into the spinal column before the procedure. This substance, or dye, causes the tissue under study to be visible. After the contrast dye is injected it appears on an X-ray screen allowing the radiologist to view the spinal cord, subarachnoid space, and other surrounding structures more clearly than with standard X-rays of the spine. The radiologist will also use a CT scan when performing a myelogram. 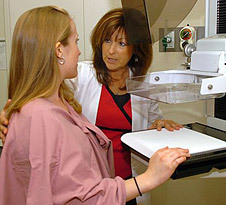 A CT or CAT scan is a diagnostic imaging procedure using a combination of X-rays and computer technology to produce horizontal, or axial, images of the body. These images, called slices, show detailed images of the spinal canal. CT scans provide more detail than standard X-rays. It is a good idea to keep a record of your past history of radiation exposure, such as previous scans and other types of X-rays, so that you can inform your doctor. Risks associated with radiation exposure may be related to the cumulative number of X-ray examinations and/or treatments over a long period of time. If you are pregnant or suspect that you may be pregnant, you should notify your doctor. Radiation exposure to the fetus may cause birth defects. Because a contrast dye is used during the procedure, there is risk of allergic reaction to the substance. Studies show that 85 percent of the population will not experience an adverse reaction from iodinated contrast; however, you will need to let your physician know if you have ever had a reaction to any contrast dye, and/or any kidney problems. A reported seafood allergy is not considered to be a contraindication for iodinated contrast. Because the contrast is injected into the cerebrospinal fluid which also surrounds the brain, there is a small risk of seizure after the injection. Some medications may place you at greater risk for seizure and you may be asked to stop taking a medication for 48 hours before and after the study. There is a slight risk of infection because the needle breaks the skin’s surface, providing a possible portal of entry for bacteria. A temporary numbness to the legs or lower back pain may be experienced. Generally, fasting is required prior to administering contrast dye. Your doctor will instruct you prior to the procedure of any necessary fasting requirements. Notify the radiologist if you have ever had a reaction to any contrast dye or if you are allergic to iodine. Notify the radiologist if you are pregnant or suspect that you may be pregnant. Notify your doctor of all medications (prescribed and over-the-counter) and herbal supplements that you are taking. You may be asked to stop some of your medications prior to the procedure. Sedation may be given prior to the procedure to help you relax. Notify the doctor if you have a history of seizures or if you are taking any prescribed medications for seizures. A myelogram may be performed on an outpatient basis or as part of your stay in a hospital. Procedures may vary depending on your condition and your doctor’s practices. You will be asked to remove any clothing, jewelry or other objects that may interfere with the procedure. During the procedure, you will lie on your stomach on the fluoroscopy table. Your back will be cleansed with an antiseptic solution and draped with sterile towels. The radiologist will anesthetize the skin by injecting a local anesthetic that numbs the site. This injection may sting for a few seconds, but makes the procedure less painful. A needle will be inserted through the numbed skin and into the subarachnoid space where the spinal fluid is located. You will feel some pressure while the needle is inserted, but you must remain still during the insertion of the needle. The radiologist will remove some of the spinal fluid from the spinal canal. Next, a portion of contrast dye will be injected into the spinal canal through the needle. You may feel a warming sensation when the contrast dye is injected. The X-ray table will be tilted in various directions to allow gravity to move the contrast dye to different areas of your spinal cord. You will be held in place by a special brace or harness. More contrast dye may be administered during this process through the secured lumbar puncture needle. The needle is then removed and required X-rays or CT scan pictures will be taken. You should notify the radiologist if you feel any numbness, tingling, headache, or lightheadedness during the procedure. You should remain in the with your head elevate for four hours after the procedure to reduce your risk of developing a CSF leak. You will be asked to drink additional fluids to rehydrate after the procedure. This helps to replace the spinal fluid that was withdrawn and reduces the chance of developing a headache. A nurse will monitor your vital signs (blood pressure, temperature, pulse, and respirations) frequently after the test. Analgesic agents may be administered if you develop a headache. Once you are at home, notify your doctor of any abnormalities, such as numbness and tingling of the legs, blood or other drainage from the injection site, pain at or near the injection site, inability to urinate, fever, stiff neck, or headaches. If the headaches persist for more than 24 hours after the procedure, or when you change positions, you should contact your doctor.